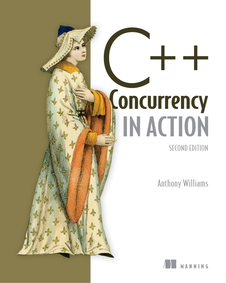 C++ Concurrency in Action (second edition, published 2019 by Manning Publications) is the definitive reference and guide to writing multithreaded code with Standard C++. It is suitable for all levels of C++ programmers, including those who have never previously written any multithreaded code. This book will show you how to write robust multithreaded applications in C++ while avoiding common pitfalls. Systems with multiple processors or processors with multiple cores are the norm these days; even many phones have multicore processors. To take advantage of these processor cores you need to use concurrency, either in the form of multiple processes or multiple threads. The C++17 standard provides extensive support for writing multithreaded code to take advantage of these multicore and multiprocessor systems. C++ Concurrency in Action explains how these facilities work, and how to use them to best effect. This book provides a tutorial covering the use of the library facilities introduced in the last three C++ standards. It covers everything from the basics such as std::thread, std::future and std::condition_variable, to an in-depth description of the new memory model and std::atomic classes for low level synchronization and the new C++17 parallel algorithms. In later chapters, the book then goes on to cover the design of multithreaded code, including lock-free data structures and thread pools. Finally, there is a chapter on testing and debugging multithreaded applications. It doesn't stop there though: the appendices include a brief overview of the some of the C++ language features either used by the multithreading facilties, or commonly used in conjunction with them, such as variadic templates, lambda functions and rvalue references, as well as a 150 page reference covering every class and function in the C++ Standard Thread Library. The book also covers the additional facilities from the Concurrency TS that aren't yet part of the main C++ standard.